Paige can be a bit of a nightmare to eat with at times. 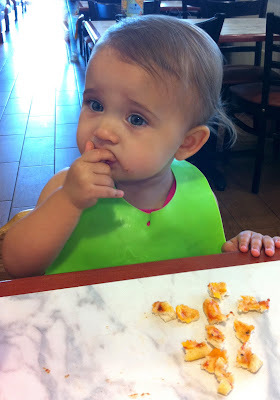 Once she's got her bib on, it's her opinion that she should have handfuls of food stuffed in her mouth constantly. If you're not assisting her, or if she thinks you're moving too slowly, she will squeal at you and throw a fit. It's hard work with her once she gets going.